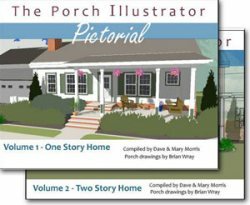 Durham North Carolina, home to Research Triangle Park, and Duke and North Carolina Central universities, can also proudly boast about their fabulous front porches. 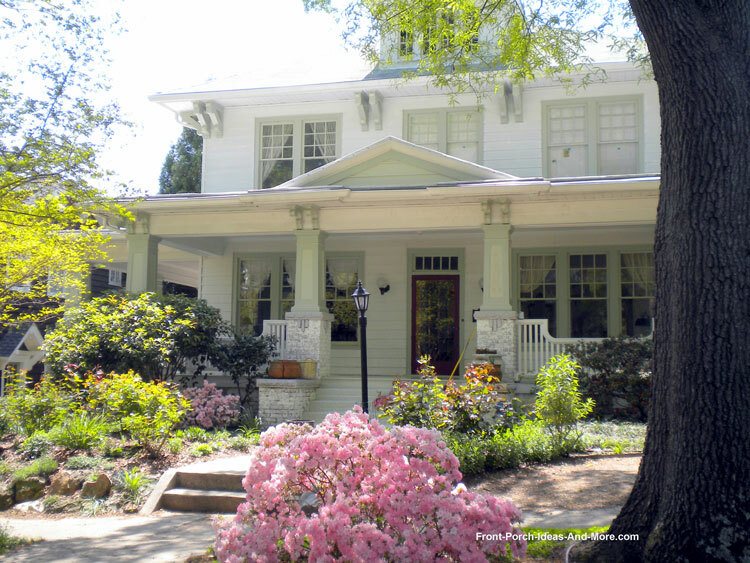 Historic neighborhoods abound like Fayetteville Street, Old West Durham, Forest Hills, and many others with grand and unique porches of varied architectural design. 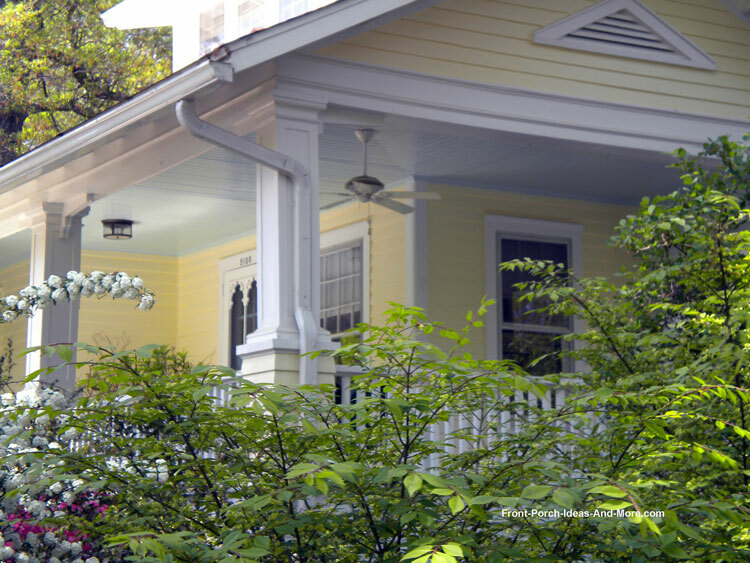 Mary and I visited during the spring and had fun taking photos of Durham's porches. 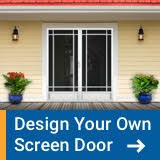 We hope you enjoy our pictures and ideas to help design and decorate your own front porch. 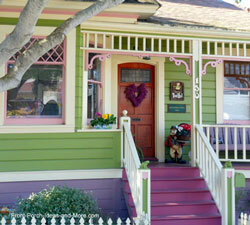 Pay particular attention to the roof design over the porch in the above photo. 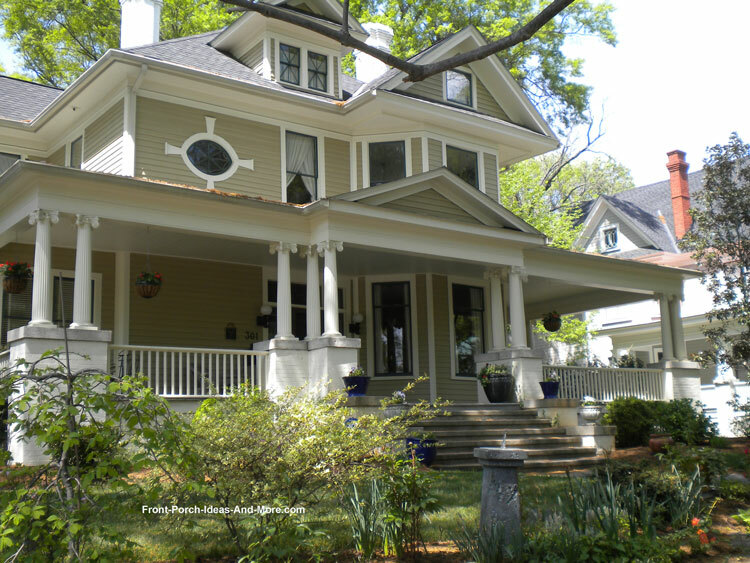 They combined a gable roof over the steps with a hip roof to maintain the architectural style of the home. The combination of craftsman-style pedestals along with round tapered double columns makes this a substantial-looking structure. 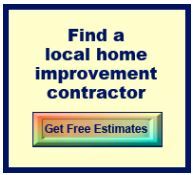 This is a very good example of a gable roof (again over the steps) on a shed-type porch roof (photo above). The exposed brackets and arched vine create a visible main entry to the home. 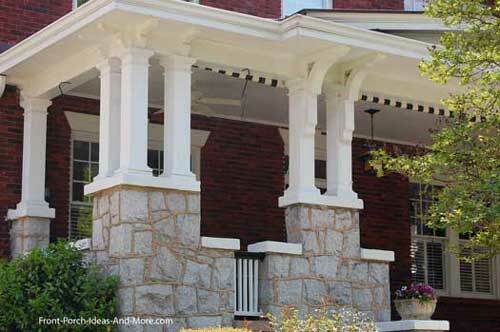 Also noteworthy, are the fluted round tapered columns. 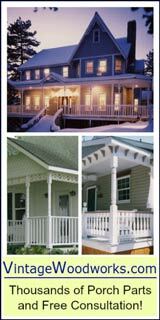 The porch above is adorned with triple craftsman-style square columns on corners with stone pedestals underneath and heavy-duty brackets. We also like the outdoor curtains which are slightly visible beneath the beam. 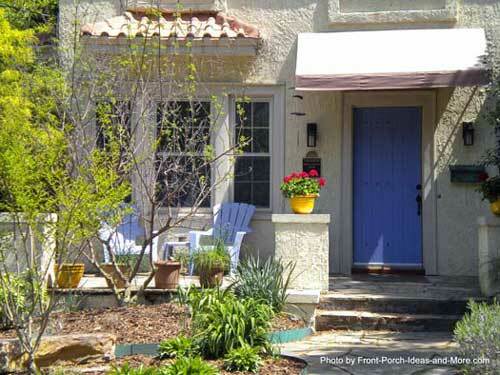 Haint blue porch ceiling and outdoor ceiling fan make for a great front porch. 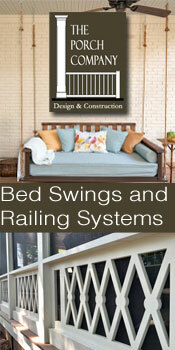 Check out the porch window treatments on the porch above. 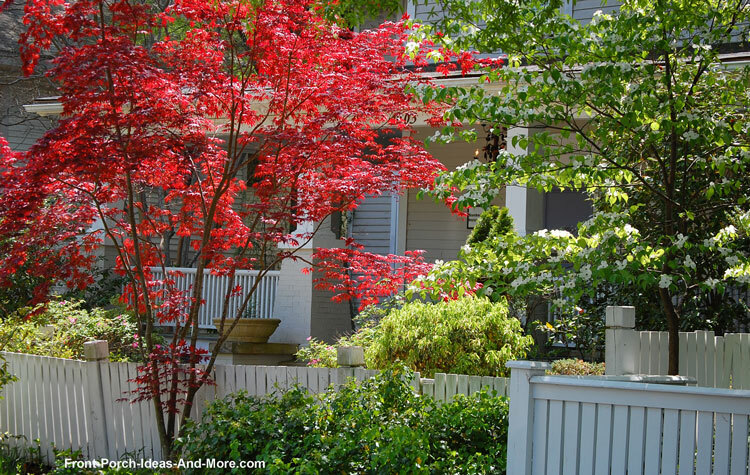 Often times, you can use window treatments like these to create lots of curb appeal. 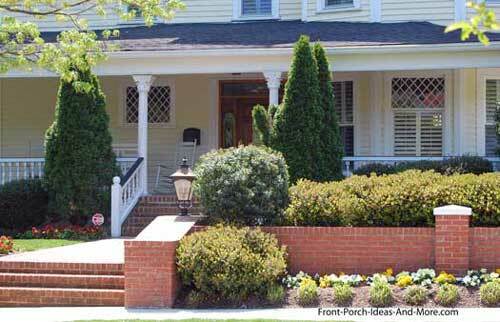 Another perfect example of combining porch roof architectural styles that we found in Durham North Carolina. The shed roof above is complemented by a gable roof over the steps. Also note the unique railing design which tends to soften the overall look. At first glance I thought these were actually outdoor artwork. Upon closer examination, these are beautiful stained glass windows! 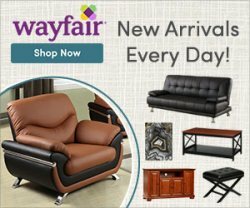 This is one of our favorites - the colors give it loads of appeal. 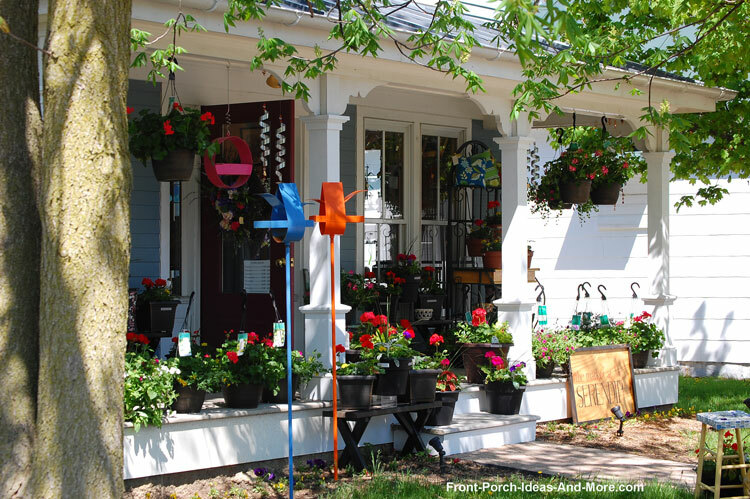 The main colors on the door and shutters are complemented by the small wreath over the doorbell and the blooming foliage in the pot on the porch and tree in the yard. 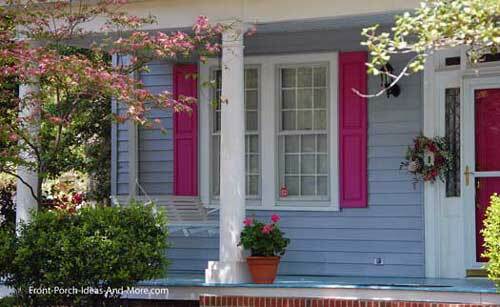 This porch definitely makes a statement! 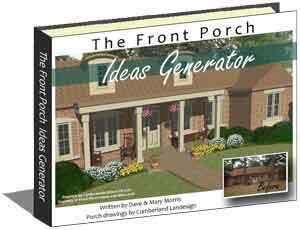 We like that they extended their small porch with a patio, what we like to call a porch patio extension! 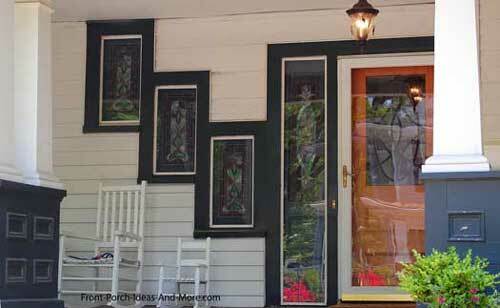 This is an easy way to transform a small portico into usable and fun space! 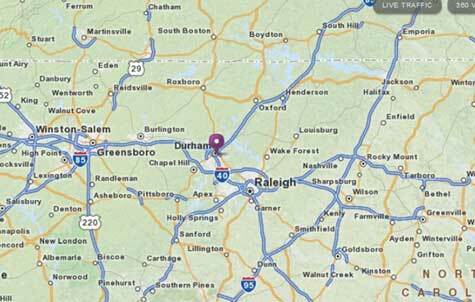 Durham North Carolina is a fun place to visit. Mary and I really enjoyed walking the neighborhood streets of Durham and invite you to explore this great city and great porches around every corner! 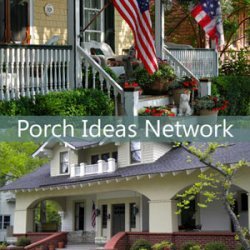 If your town has attractive porches, then please let us know. You never know...we might stop by. 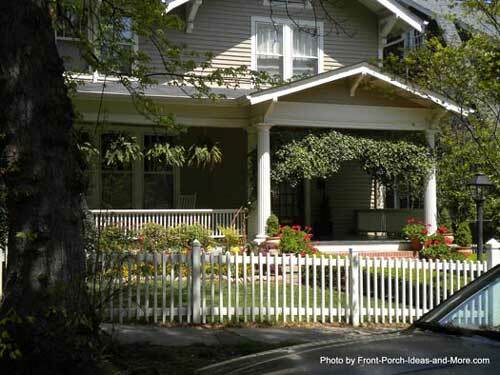 If you'd like to know how we travel around to charming places and get paid to look at beautiful porches, we're happy to share.